This is Sadaf’s Kashfi’s first contribution to Organization Unbound. She recently dropped us a line to tell us about an intriguing specimen of an organization she stumbled across in her travels and proposed writing a reflection on her experience there. It is a beautiful example of an organization that is deeply grounded in human experience. 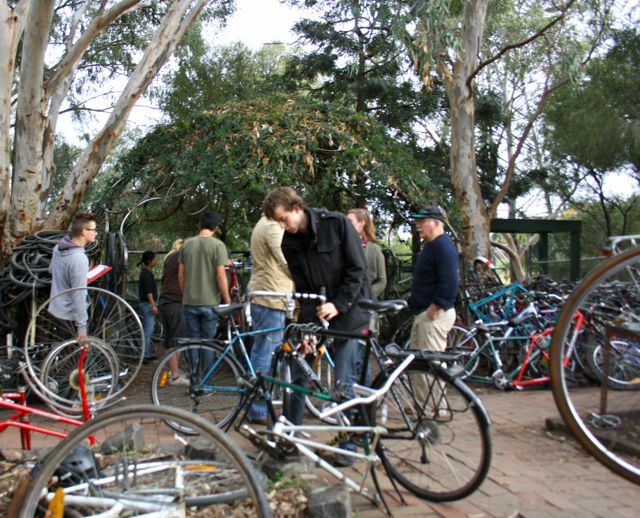 This is an account of my experience volunteering with the Bike Shed during my stay in Melbourne, Australia. I wrote this piece with the help of my fellow Bike Shed volunteers who supported me and corrected me along the writing process. I like to thank them for taking me in, showing me the ways of The Shed, and for teaching me that behind the success of an organization is genuine relationships. The Bike Shed, known affectionately as simply ‘The Shed’, is a small non-profit organization located inside 11 acres of a redeveloped landfill in Melbourne, Australia. The Shed is set-up inside a now picturesque community environmental park filled with solar panels, community vegetable gardens, barefoot children, and chickens. When approaching The Shed you will see a crudely organized junkyard of bikes stripped of all usable parts; high piles of tires and wheel rims stacked with some obscure algorithmic disorder; another pile of better looking bicycles, some with vital organs missing; all of this overshadowed by a two-story shed made from roofing iron and overfilled with more bicycles and parts. Clustered around The Shed’s crude infrastructure, underneath a large eucalyptus tree (which threatens to drop on the entire operation) toils a greasy, dirty, and at times dehydrated group of people, working on whatever surface available. For most onlookers it seems like an overcrowded and ill-lit communal garage of strange tools and parts that people have casually picked up and for one reason or another could not disengage from. However, if you were to take a second look, you would realize that within the seeming chaos there is a small group of individuals who are more heavily covered in grease, incisively carrying parts and tools. More importantly, they are not working on a single bicycle but assisting others with repairs. This is truly the only way to distinguish a member (a patron of the organization working on a personal bicycle) and a volunteer (a person helping and teaching others bicycle mechanics). Although even this distinction can at times fail the observer, as everyone at The Shed within their own capacity assists those around them. At any given time, there is likely to be an unordered line of people waiting outside the entrance of The Shed looking confused, intimidated and slightly concerned. They are all waiting for a sign, a greeting one would expect from any usual store or organization. However, in this ‘disorganization’ (as it’s often referred to), one quickly learns to forego such expectations and to practice the art of patience and humility. With time, persistent eye contact, and perhaps a certain look of despair, eventually a volunteer will give into guilt, put the other members they are assisting on hold, and speak with these newly arrived patrons. If the volunteer stops and initiates conversation, that lucky patron has a brief window to prove the worthiness of their cause and ultimately establish whether they will receive assistance. Respect and patience are the ultimate variables that will determine the likelihood of a patron riding away with a bicycle. Despite the seeming egocentric behavior of the volunteers, it is certainly not to make members subservient to them. The aim is to initiate them into the workings of The Shed and to encourage members to take the lead and experiment with fixing their bicycles. Now, this may seem like a harsh environment to spend precious weekends, especially given that there are several bike stores surrounding The Shed. Yet every Friday, Saturday, and Sunday a slew of people arrive with either their bikes for repair or with a vague idea of a bicycle they hope to ride home. The unexpected popularity of The Shed can be attributed to a few factors: pricing is unbeatable (at times people wait for long periods of time for someone to even collect their money), the process of refurbishing a bicycle can be quite a meditative and creative experience (although volunteers remind members that it’s not about esthetics here), and The Shed is a hub of tacit knowledge acquired from years of working on obscure bicycles. As such, volunteers take a great amount of pride in helping others overcome the obstacles of fixing a bicycle using primarily recycled pieces. And, they engage in this sharing in an unconditional way. As one volunteer stated, “the giving feels like the getting”. Once members get past the initial challenge of putting together a jigsaw puzzle of missing parts, they quickly realize that something greater than bike repair and the inhalation of kerosene is happening here; a sense of purpose and community is beaming through the interaction of those involved in the repair. As one volunteer stated, “at The Shed each journey of fixing a bicycle creates an anecdote of the individual person you work with…although The Shed creates a big picture of providing people with the skills and tools to maintain a bicycle, the smaller picture is the interaction between two people facing a challenge”. And the sweat, tears and potential screams are all worthwhile when the toughest volunteer gives a new bicycle rider a push up the hill for that final test ride. Unlike other volunteer organizations, The Shed only passively recruits volunteers. Members seem drawn to finishing their own projects only to return and assist others with their newfound knowledge (regardless of how limited it is). The usual strategy is to just keep showing up and hope that someone will pass on the volunteer registration form. With this initial step, the new volunteer has access to lunch, a very special and important time at The Shed. Lunch is the halfway point where all volunteers are compulsorily collected to sit down and share a meal, to laugh or rant about the absurdities of the morning. The Shed activity usually contracts for that time, and members find a place to hydrate, deliberate or simply disappear. The confused and haphazard acquisition of the volunteer registration form is the first hurdle to entry to The Shed’s community of volunteers. It is through this mechanism that The Shed selectively obtains volunteers who fit within the unwritten, undefined, and unexpressed ethos, which I daringly summed up as having the purest motives of wanting to teach people about bicycles for its own sake, and nothing else. Indeed it is not uncommon for volunteers to grill an aspiring volunteer by asking them “Are you into bikes or just into volunteering?” Core volunteers care deeply about the motives of aspiring volunteers and in this way protect the ethos and organizational culture of The Shed. Once a volunteer jumps through this initial gateway, they receive no formalized training. In fact most of the orientation energy is spent on speaking with them about the abilities and temperaments of other volunteers. Through this discussion, the trainee draws a blue-print of strengths and weaknesses of fellow volunteers, focusing on relationship-building rather than skill acquisition. Upon establishing such relationships they will effectively know who to ask for assistance and begin to learn by witnessing. This process should not be misinterpreted as being formal or indeed a predictable and sequential process. This blue-print building develops while the novice is assisting members or over a couple of drinks at the end of a shift. It would appear that within The Shed the knowledge of the physical layout and social landscape is functionally more important than technical skills. The second hurdle is the invitation to the exclusive monthly meetings. At these meetings all the issues of the month are formally raised and collectively discussed. What appears at first to be a system of anarchy suddenly manifests as being organized by tradition. There is a ritual for initiating new volunteers, formalized by speeches, procedures and a much respected system of trust. Invited volunteers stand before the Committee and ask to be officially accepted. Once the request is presented, at least one Committee member has to vouch for that volunteer. As one Committee member stated, “this system of trust enables the volunteer to become a decision maker; when one has to make a judgment call without consulting the rest of the crew”. The final hurdle is that volunteers are not permitted to vote on motions unless they are elected to the Committee, the core governance body of The Shed. They are also not allowed to make operational decisions without being accepted as a Key Holder. 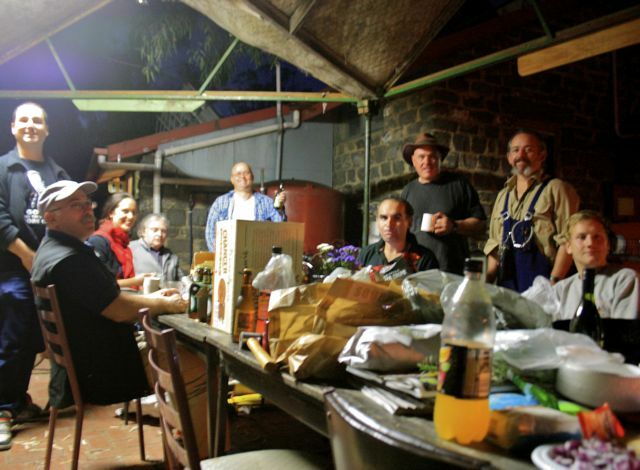 Key Holders are volunteers who have earned the responsibility to manage the day-to-day running of The Shed during their scheduled volunteer shift. Whereas the rest of the volunteers roam free and appear at The Shed when they are up for it. The Shed meetings are somewhat curious in that the Committee members too comfortably admit that despite the careful recording of the meeting notes with the passage of every motion, no one is formally or informally responsible for enforcing the resolutions (with the exception of a few crucial issues). Thus, the extent to which any motion gets put into practice depends largely on the initiator’s ability to garner enough collective support and their degree of persistence in applying the motion themselves. Despite the seeming rigidity of the Committee and Key holder status, the entire process appears to be amorphous and anarchic. This is best illustrated by the fact that while having no recognized voting rights or duties, a volunteer has the ability to initiate a project, lead a committee and indeed receive a budget from The Shed’s funds. The volunteer who persists through The Shed’s spoken and unspoken rituals and rites of passage will eventually have the ability to launch side-ventures and, with persistence, shape the structure of the organization. And most importantly, they come to feel part of a greater social unit. 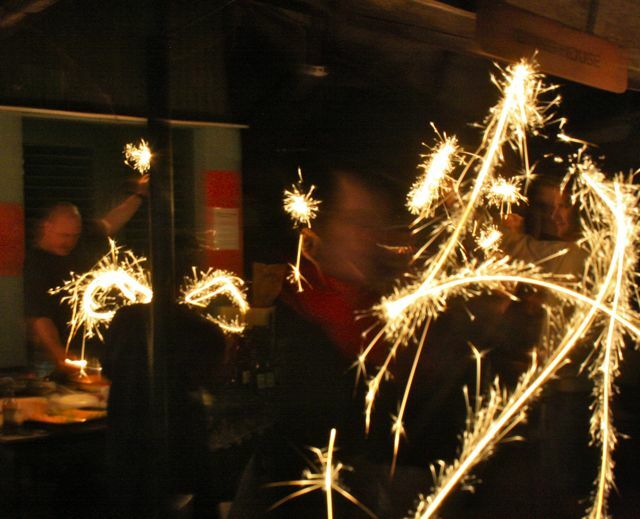 Birthdays, major life events, and departures are celebrated or grieved among the volunteers, and the barrier between Shed-related events and personal events fades and eventually ceases to exist. The general interaction between volunteers feels more like a large communal family than an organization. The Shed engages in a delicate dance. A disguised order twists and turns within an open structure creating a ‘no suppression zone’. Volunteers openly express their likes and dislikes about practices without friction or any inclination towards conformity, while at the same time preserving a very inclusive social circle where differences and temperaments are not just tolerated but embraced. Ultimately debate and dissent tend to dissolve into oblivion, with someone always anchoring the discussion back to the core of the issue. While displaying all the entrenched practices that characterize an almost tribal culture, these same practices and processes are constantly evolving. In the end, the one thread that runs constantly through the weave that constitutes The Shed is untainted and continuous dialogue.